Matthew Yglesias (/ɪˈɡleɪsiəs/; born May 18, 1981) is an American blogger and journalist who writes about economics and politics. Yglesias has written columns and articles for publications such as The American Prospect, The Atlantic, and Slate. Currently, he is an editor and columnist for the news website Vox, which he co-founded in 2014. Yglesias's father Rafael Yglesias is a screenwriter and novelist and he has a brother named Nicolas. His paternal grandparents were novelists Jose Yglesias and Helen Yglesias (née Bassine). His paternal grandfather was of Spanish-Cuban background, and his three other grandparents were of Eastern European Jewish descent. Yglesias went to high school at The Dalton School in New York City and later attended Harvard University where he studied philosophy. Yglesias started blogging in early 2002, while still in college, focusing mainly on American politics and public policy issues, often approached from an abstract, philosophical perspective. Yglesias was a strong supporter of invading Iraq, Iran and North Korea, calling the countries on his blog "evil" and stating that "we should take them all out," although he was critical of the term "axis of evil." He later called his attitudes about the war a mistake. 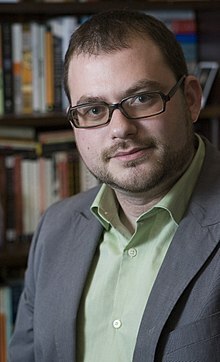 Yglesias joined the American Prospect as a writing fellow upon his graduation in 2003, subsequently becoming a staff writer. His posts appeared regularly on the magazine's collaborative weblog TAPPED. From June 2007 until August 2008, he was a staff writer at The Atlantic Monthly, and his blog was hosted on the magazine's website, The Atlantic. In July 2008, he announced that he would leave The Atlantic Monthly for the Center for American Progress where he wrote for its blog, ThinkProgress, because he missed "the sense of collegiality that comes from working with like-minded colleagues on a shared enterprise" and thought he could "help advance their mission". On November 21, 2011, he left ThinkProgress to work as a business and economics correspondent at Slate's Moneybox. On or before 2010, Yglesias coined the term "pundit's fallacy" to denote "the belief that what a politician needs to do to improve his or her political standing is do what the pundit wants substantively". Andrew Sullivan formerly took nominations on his blog for the Yglesias Award, an honor "for writers, politicians, columnists or pundits who actually criticize their own side, make enemies among political allies, and generally risk something for the sake of saying what they believe." Yglesias has stated that he voted for Mitt Romney when he ran for Governor of Massachusetts in 2002. In February 2014, he left Slate and joined Vox Media to co-found Vox with Ezra Klein. Heads in the Sand: How the Republicans Screw Up Foreign Policy and Foreign Policy Screws Up the Democrats, Wiley, April 2008, ISBN 978-0-470-08622-3. ^ Reeve, Elspeth (March 22, 2013). "Matt Yglesias' $1.2 Million House Stokes Class Envy in Conservatives". The Atlantic. Retrieved November 8, 2014. ^ Avard, Christian (July 22, 2008). "Matt Yglesias: A Case for Liberal Internationalism | Huffington Post". The Huffington Post. Retrieved October 3, 2016. ^ "The Myth of Majority-Minority America". slate.com. May 22, 2012. Retrieved November 29, 2015. ^ "Matt Yglesias Bio". TheAtlantic.com. Retrieved July 20, 2012. ^ "Yglesias Blogspot on Iraq". ^ "HYPER-HAWKISH TNR EDITORIAL". Blogspot. ^ "Four Reasons for a Mistake". August 19, 2010. Retrieved February 25, 2017. ^ "Observer.com". Retrieved November 21, 2011. ^ "Slate". Retrieved November 21, 2011. ^ Yglesias, Matthew (August 2, 2010). "The Pundit's Fallacy". ThinkProgress (blog). Retrieved January 23, 2018. ^ "This week in the pundit's fallacy". Democracy in America (The Economist). May 1, 2012. Retrieved January 23, 2018. ^ Krugman, Paul (May 24, 2012). "How to End This Depression". The New York Review of Books. Retrieved January 23, 2018. ^ Sullivan, Andrew. "The Daily Dish Awards". The Daily Dish. The Atlantic. Archived from the original on February 11, 2007. Retrieved March 20, 2017. ^ Klein, Ezra (January 26, 2014). "Vox is our next". Retrieved February 25, 2017.